Hamburg-Reitbrook is home to what many consider an extremely compact and efficient Power-to-Gas plant: the WindGas system. It was inaugurated on Oct. 15, 2015, after being set up by a company consortium during a three-year preparation period under the auspices of an NIP subsidy project. Both Hamburg’s First Mayor, Olaf Scholz, and the Parliamentary State Secretary of the Ministry of Transport, Norbert Barthle, were missing during the ceremony despite an announcement to the contrary, but WindGas was brought into operation anyway. As planned, “green hydrogen” began to feed into the regional natural gas grid after the push of a button. It all started in 2010 with a conversation during the Hanover trade show: Some of the current project partners talked about the opportunities of scaling electrolysis systems. Even back then, the ultimate target was megawatt size, although there weren’t any plans for a quick realization of that target. The project became a more concrete endeavor only in 2012: At that time, the target was 3,500 MW of electrical energy fed into the power grid each year by solar, bio and wind power systems in Schleswig-Holstein. 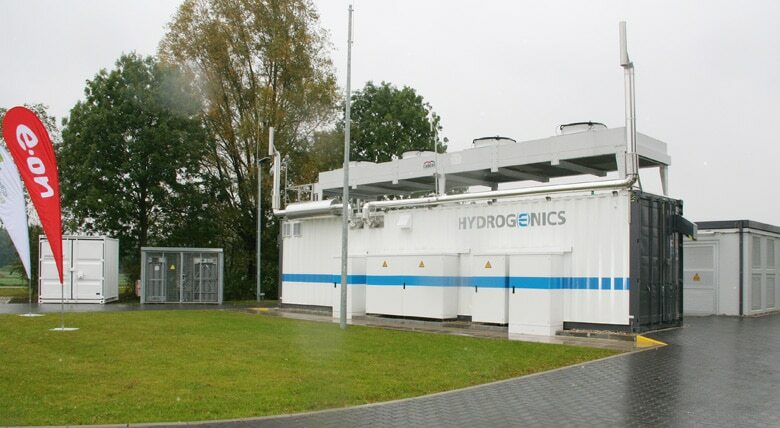 The number has meanwhile increased to 7,000 MW, and part of it is said to be used to create hydrogen (WindGas) through electrolysis within the EUR 13.5 million research project, in order to feed it into the natural gas grid. Actually, regular operation had already been scheduled for the beginning of 2015. This couldn’t quite be achieved, however. But “the plant stayed within the confines of the budget,” Dr. Peter Klingenberger, Chairman of the Management Board of E.ON Gas Storage, was happy to announce. The electrolysis system used in the project is from Hydrogenics and possesses a PEM (Proton Exchange Membrane) stack measuring a mere 55 cm x 70 cm x 90 cm. In spite of its rather small dimensions, the hydrogen generator offers a maximum power input of 1.5 MW. It was installed in a 40-feet container that is 2.5 m in height and is supplied by tap water. The water is cleaned and deionized by osmosis in a special treatment facility. Additionally, there was a voltage transformer installed on-site, which converts the power down to 400 V.
After creation, the H2 gas in Reitbrook is compressed to 15 bar before being fed into the distribution network. The central monitoring station in Essen controls the plant, as well as its sister version in Falkenhagen. The biggest difference between these two plants is that the latter located in the Prignitz region had alkaline electrolysis systems installed, whose power density of 0.5 A/cm2 is four times lower than the one of the PEM units. The targets of this northern German subsidy project are the creation of a prototype in the metropolitan area of Hamburg and the testing of this type of PEM electrolysis system for plants above 1 MW over an initial period of one year. Currently available PEM systems possess a power input of up to 100 kW. Above this performance threshold, the preferred units to use are alkaline electrolysis systems (for example in Falkenhagen). That the present plant made it possible to leap into the megawatt field was called “a big step” by Dr. Klaus Bonhoff, Chair of the National Organization for Hydrogen and Fuel Cell Technology, which contributed EUR 6.5 million to the project. Bernd Pitschak, CEO of Hydrogenics, mentioned the possibility of even bigger plants in the future when talking to H2-international about the topic. For example, there is the current installation of a new 2-MW plant in Canada, which could be upped to 5 MW. In his view, plants with a power of 5 to 10 MW could be possible very soon. The sustainably created hydrogen in form of a natural gas and hydrogen mixture (WindGas) is marketed by E.ON. 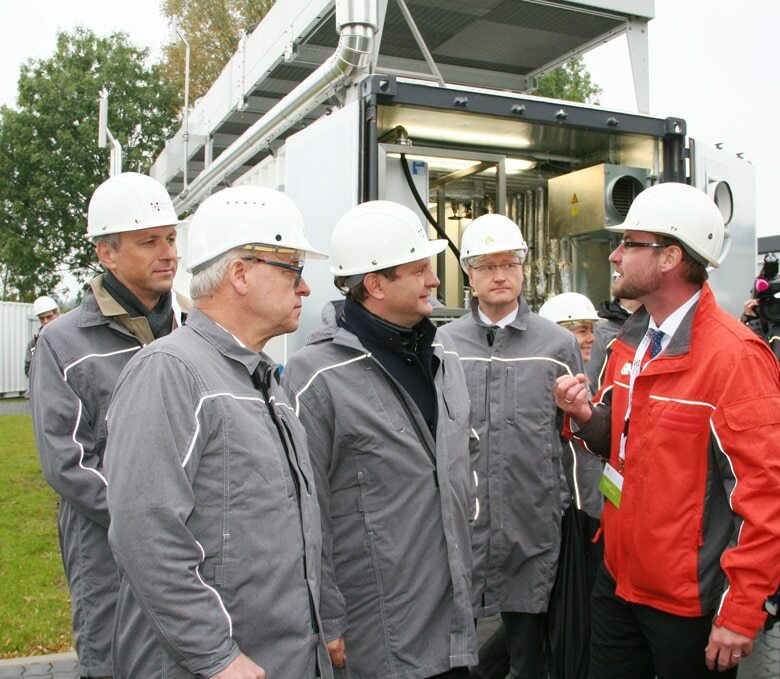 CEO Uwe Kolks explained that the company would increase the “share of regenerative wind gas in our product from ten to fifteen percent” in November of 2015 (which did happen) because the hydrogen could now be retrieved from two plants (Falkenhagen and Reitbrook) and supply a greater number of customers.